While some of the greatest pop up campers are no longer being made, there are a lot of solid manufacturers that are still in business. For instance, Coleman is no longer in the game (after some recent funny business, the the name has been retired a second time, although Dutchmen owns the license to produce travel trailers with the Coleman name), but there are still a lot of long-standing, reputable manufacturers like Starcraft and Jayco to choose from, and even the massive Forest River is still making new pop up campers these days. In general, new pop up campers can be broken down into three categories: tent trailers, a-frames, and pop up truck campers. You’ll also find especially small pop ups that are sometimes referred to as “tent-on-trailers” and a number of manufacturers also built pop up motorcycle campers. If you’re just starting to look at new pop up campers, then there are a few questions you can ask yourself. After you’ve assembled that information, you’ll be able to look at each manufacturer’s list of pop ups and select the ones that fit your specific needs. Try out the beds to make sure they fit! How many people will be sleeping inside the pop up? Do you need a pop up camper with a bathroom? What hitch class does your car or truck have? What’s the towing capacity of your car or truck? Do you want to be able to cook inside? Will you camp in cold weather? Will you camp in hot weather? Where will you camp the most, and will electricity be available? There are many other things to consider when considering all the different styles and designs of new pop up campers, but questions like those will put you on the right track. 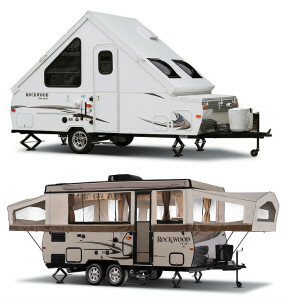 New pop up campers are available in a variety of weight classes and styles. Some of these manufacturers also make travel trailers, 5th wheels, and even motorhomes. Others, like Lifetime Products, Inc., specialize in camping gear and other types of products in addition to their pop up campers. Each manufacturer is unique and has its own strengths and weaknesses, so there is really a new pop up camper out there for everyone. 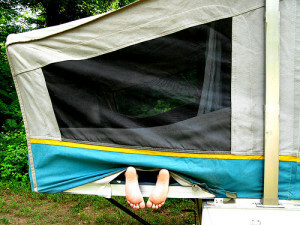 Of course, the best part about shopping for a new pop up camper is actually getting inside them and trying them out. That’s the only way you’ll really find out whether a particular make or model is going to suit your needs. Make sure to check out each of the beds to see how comfortable they are, see how easily each model pops up and folds down, and how well the doors, zippers, and other components function.